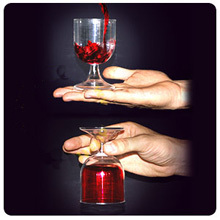 The magicians shows a transparent plastic glass, he fills it up with some wine and with the hand closes the upper side. Then he overturns it and after having removed the hand he shows that the wine stays suspended without dropping. Then he empties the wine inside a jug and gives all to be examined. A full glass of water is produced from under a silk showed empty. • The glass is high cm 10,5 with a diameter of cm 6,5. • Instead of wine also other colored waters can be used. • Both effects are easy to perform and suitable for any kind of audience.